Use multiple monitors to write the new story using your annotions. I’ve covered the first 5 steps in other posts, and if you are so inclined, you can click on the links to learn more about what I did. It’s the last two steps that I wanted to discuss today. The top monitor contains the original Scrivener document that I wrote for NaNoWriMo, along with the annotations I made on my Kindle and transferred into Scrivener. The bottom screen contains the new novelette version of the story (show in the picture in cork board mode). I can read what I originally wrote in the top window, along with my notes and annotations, and write the new version of the story in the bottom window. So far, this has been working very well. 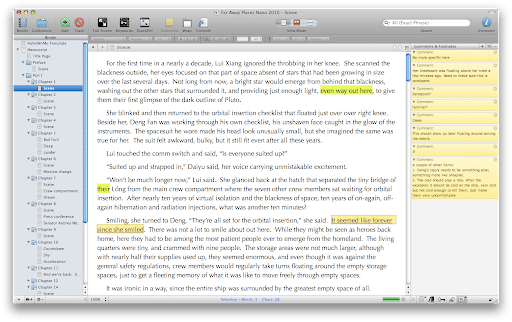 It makes me think that an interesting future feature for Scrivener might be the ability to import annotations from the Kindle Clippings file directly into an existing Scrivener document, parsing them and creating the notes as comments in the document. Of course, this would require the ability of translating a Kindle location number into a position in the Scrivener document and would only work if there had been no changes since the export to the Kindle (otherwise the location numbers might not line up). Still I think it would be interesting. Regardless, I think this is another good example of using Scrivener and Kindle together. Not only are they useful applications for writers, they are green applications and can be good for the environment. I found this (and you) when I was stumped over how to print a Kindle-looking proof draft of a book I’m converting and re-publishing on the Kindle, without printing hundreds of pages for red-penning. Then I red this and had an “oh, duh” moment. Tried it out and it works great – thanks! Also, FrameMaker recently added a feature that will pull all of the comments made on a PDF and drop them into the original FrameMaker file, so this kind of workflow is not completely unheard of. Maybe if the L&L folks wanted to pursue this, there could be an option to put some special tags or markup in the .MOBI file so that when the stuff came back, it could determine locations a bit better. No idea how that would work, but maybe it’s worth a write-up on their support forum. Jon, I’m glad to hear this helped! Thank also for pointing out the FrameMaker feature. Gary, it might be that I grew used to it from using the iPhone. You get a lot of practice there. Actually, since I got my iPad, I’ve stopped using the Kindle for annotations. I have the Kindle App of course, but personal Kindle documents are not yet supported on iPhone/iPad devices. So instead I convert the document to a PDF and use an iPad app called GoodReader to the annotations. It still allows me to be paperless, and I must admit, it is much easier typing on the iPad (even if I am not using my external BlueTooth keyboard) than on the Kindle. The Kindle App supports personal documents. Save your document as a .mobi file, connect your iPad to your computer, go into iTunes and click on your iPad under “Devices”. Go to the Apps tab, and scroll down the page. There’s a File Sharing section, click on the kindle app, and you’ll see a list of files where you can add your mobi document and sync it up. Jon, I stand corrected. Thanks for the tip. Great site! 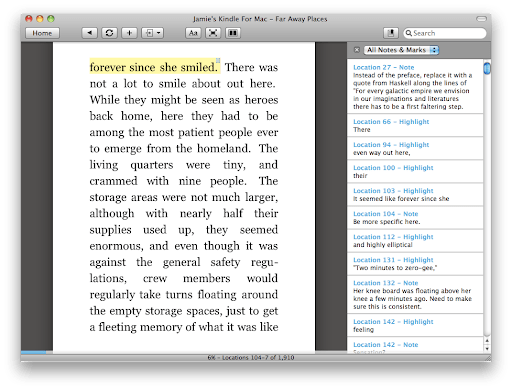 So I am writing my novel in Scrivener and exporting to Kindle Fire, where I am making annotations. Problem is, I can’t transfer these to my Kindle Mac app. Am I doing something wrong? It’s not an option on my manage Kindle page. I don’t want to copy by hand. Thanks for any advice!